Oh, what a joy to rejoin Cee and her Share Your World blogging challenge! Check out the adorable Miss Mackenzie in Cee’s photo! A piece of clothing from my childhood that I still remember: This one is easy because I remember lots of my clothes, probably from photographs. I do recall that my sister and I were often dressed as twins and my mother would even sew herself a matching dress. For this photo, my curly hair had been pasted into place, giving me temporary bangs and braids that were hanging almost vertically. I probably remember more about the agonies of getting my hair braided than any clothing! Irregardless of your physical fitness, coordination or agility: If you could be an athlete what would do do? Remember this is SYW, dreaming is always allowed. I have long pursued my desire to do a cartwheel. I could run and jump but never managed a cartwheel. When I took a gymnastic class at college, my instructor was thrilled with my passion and told me she would make it happen. I was a bit anxious, having had a number of falls in previous attempts (seriously, how do you fall while doing a cartwheel?). She lined up all the participants on both sides of me, placed a lane of mats in between, and said she would also spot me. After watching my first attempt, she encouraged me to start with more “spring.” I sprang and flew over the line of spotters, landing with a crash on the hard gym floor. On my ambulance ride to the ER, I decided I would never attempt another cartwheel. Maybe in heaven…. In a car, would you rather drive or be a passenger? Having “conquered” my driving phobia (thanks to the Lord), it is hard for my dearest teaching widower to wrest the steering wheel away from me. It’s a sign of how far I’ve come that I do let him drive us occasionally, no longer needing to practice and practice. And dord? This is a ghost word that made it into the Merriam-Webster dictionary for a surprisingly long period of time. What do you think it means? It’s a clever math strategy! Bansho was recently featured in Teaching Children Mathematics, a NCTM publication. Originally developed in Japan, this powerful visual strategy has been used successfully in Thailand and for this article, in Texas. Daphyne Miller is the featured teacher. How does it work? Bansho organizes the math learning process visually (such as across a board or wall), encouraging student-generated ideas and discussion. The board space is divided into sections that correspond to 3 phases in a lesson: activating prior knowledge, exploring a problem, and discussing/ extending the problem. Students connect their ideas to others’ work throughout the process. Teachers must anticipate student responses, provide hands on materials, and monitor student work and interactions. What does it look like? Depending on the problem being solved, a pictorial representation of the problem is on the left side, along with keywords and related vocabulary. The center section features student work, organized in columns to show a progression from concrete to abstract reasoning. On the far right, student work and teacher input extend the learning. Check out Thinking of Teaching blog for cool images. How could this be adapted to support special needs students? If you look at most Bansho illustrations, you’ll see lots of handwritten work. Using digital tools to capture student work would help those kids who struggle to spell or even draw. Smart boards could be an easy adaptation. Encourage students to use their special interests when extending the math problem to varied topics. This will likely make it easier for them to share their ideas with the group. Allow video recordings for those kiddos who are reluctant to share in a large group. Be creative in reducing the visual clutter of a Bansho display. This could include digital instead of paper worksheets, using a smart board for the entire display, or placing the three sections or phases onto separate boards. If you’re a teacher and earning CEUs to renew your license, there are a lot of terrific inservice opportunities. Many districts offer their own packages and provide in-school workshops. As a longtime National Board Certified educator, I am really pumped about microcredentials. These are additional credit options which allow you to extend and personalize your online learning experience. My experiences are based on the Friday Institute through the North Carolina State University’s College of Education. Their MOOC courses are FREE premium offerings for folks worldwide. I am still in the process of completing some microcredentials for a fantastic course called Problem Solving in the Digital Age. How do microcredentials work? They provide the option of going beyond the basic course requirements, while earning more CEUs, of course. In my case, I am taking the skills I learned and applying them to a real world teaching problem. I took this course to solve a particularly perplexing problem and I emerged inspired and equipped. Now I am demonstrating my learning while continuing to address my complex problem. Earning microcredentials is a lot like the National Board process, with an emphasis on best practices, applying research, and lots of reflection and processing. It’s a data-driven process, but meaningful- not just plugging numbers into boxes. What’s better than the pure application of learning to your current practice? Some of my past experiences with staff development were awesome. But other “opportunities” left me wishing I could have gone swimming instead. As I glanced around the room, I could see teachers struggling to stay awake, doing lesson plans, passing notes, and keeping a neutral expression while desperately wishing they could use their time productively. Online learning (at the Friday Institute level), in conjunction with microcredentials, provides authentic learning experiences which can be tailored to suit my individual situation. Isn’t that what we want for our students? Lauren Acree has written a comprehensive evaluation of microcredentials, in case I haven’t convinced you! 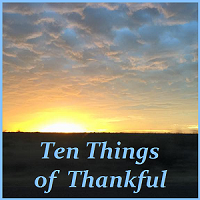 Thank you so much, sweet Josie, for hosting this weekly reminder to share thankfulness. In my case, it’s more annually, but perhaps I shall get back on track with blogging again! Today is my sister’s birthday and I am so thankful for her! She’s got a heart of gold! I love her! Speaking of her heart of gold, the kiddos return this week for a summer in North Carolina! We will have a special movie night on Tuesday! Woohoo! I finished all my online classes, despite the flu and eardrum and sinuses and everything. Now I am on to my microcredentials. More on that in my next post. I think there will be another post! Yes! The parents of my kiddos are THE best. Patient, loving, encouraging, funny, dedicated to their kids to the nth degree! I am GRATEFUL for their never-ending support. What would the world of writing be like without exclamation points?!? I am hopeful (and grateful) that you can hear my enthusiasm! I am grateful that my energy levels and wildness fall just short of ADHD and mania! What would this blog be without my faithful followers? Thank you for reading and waiting and waiting and waiting! I got a new bible this week, reverting to paper again so I can search and scribble and highlight and weep for joy. I do all my other reading in digital form, but I could never find my spiritual home online. This one is for clarkscottroger, a clever man with one of the most unique ways of seeing himself and the world. If you like ingenious and funny, his blog, the Wakefield Doctrine, is for you!